Noon: Saturday afternoon we attended a birthday party in La Mesa. For some inexplicable reason (Kristi even questioned me as I drove), I took I-15 to 52 East to 125 South, through Tierrasanta, the Mission Gorge Trails Regional Park, and Santee, rather than the traditional route I-15 to I-8 East. Little did we know we were getting our last look at this unspoiled terrain: within 24 hours Route 52 would be a failed fire break and houses would be lost in both Tierrasanta and Santee. 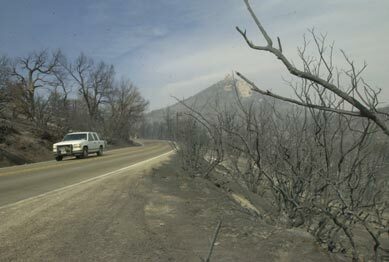 7:00 p.m.: That evening the news carried stories of a fire that started around 5 p.m. south of Ramona. I remember thinking about the people I knew from work that lived in that area and hoping they were all right. I didn't think about wind direction, low humidity or the fact that many San Diego-based fire fighting resources had been sent north to help on the San Bernadino brush fires. 7:30 a.m.: Sunday morning the kids have the TV on watching special reports about the fire. Bradley has gotten out our book on the Cerro Grande fire in Los Alamos in 2000. He tells me that the Cerro Grande fire burned 7000 acres its first day, then tells me this fire near Ramona has already burned 70,000 acres in a mere 12 hours. Secure in the knowledge that this simply isn't possible, I tell him that he must have heard the report wrong, and go back to planning my Sunday school lesson without watching any TV. The kids don't report any geography on the fire. 8:00 a.m.: The first time we become aware that something is Really Wrong is when we exit the house to the car in the driveway and look up. The entire southern sky is choked with smoke. This is fairly "fresh" smoke, with billows still visible, not in the air long enough to be dissipated or blurred by the steady wind. Still with no concept of geography, we head to church. We take our usual route, heading immediately West along a back road before finding Interstate 5 and heading South. We would have been quite surprised had we taken the alternate route, I-15 South to 52 West. This was the fire's southwestern course on Sunday. MCAS is Miramar Marine Corps Air Station, mostly open brush. Points of interest: Keith works at Intuit, at the northwest corner of 805/52 intersection. 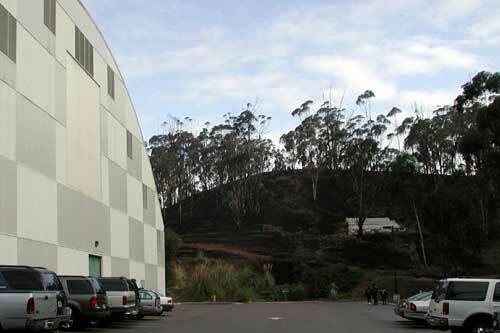 Brad's basketball practice facility is at approximately the 'C' in "Scripps" in Scripps Miramar Ranch. We live off the map to the North. Interstate 15 looking South, a couple miles north of 163 Split. Southbound traffic heading the wrong way up an on ramp to escape the fire in front of them. 8:20 a.m.: Sometime on the way south we drive under the pall of the smoke. Church, just west of the I-5 and Rt 52 intersection, is a dark, dreary, and smelly place. Midway through Service it is announced that Scripps Ranch is being evacuated. 9:40 a.m.: By the end of Service, Tierrasanta is too. Sign up sheets are set up for people who can house displaced families. I start my Sunday school class. Kristi interrupts to inform me she is going with the minister's wife back to their house in Tierrasanta to help grab essentials. I'm told I'm now in charge of minister's daughters (4) at the end of Sunday school class. Interstate 15 (left to right)/ Route 52 (top to bottom) interchange. Picture taken looking west, from helicopter above Tierrasanta. Keith takes the high bridge from West 52 to North 15 everyday on the way home from work. 10:10 a.m.: Kristi and Shelly are among the last to use highway 52 before it is closed. 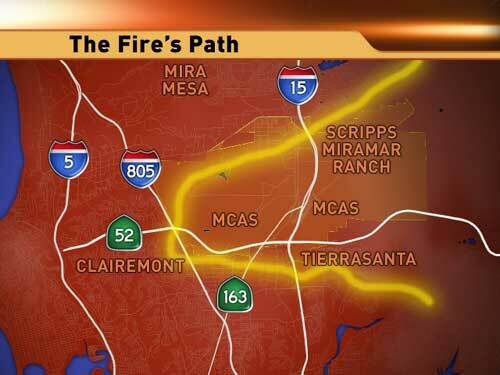 It and Interstate 15 are about to be used as firebreaks. Unsuccessfully. Kristi helps Shelly grab clothes and a few things from the house. Her father-in-law shows up with a pick up truck, which they load. They try to save the classic 60's Ford pickup in the garage, but it won't start, and so it is left. Police cars were wandering the neighborhoods ordering evacuation; their eerie announcement heard before they were seen. Highway 52 to the north is now closed, they have to exit Tierrasanta by surface streets to the South. 10:45 a.m.: After Sunday school class, I notice radios on all over church as everyone struggles to pinpoint where the fire is now in relationship to their community and their home. The minister's children begin to wonder if they'll have a home to go back to. After much discussion about what to do and where to go, I and another parent decide to take them to a third parishioner's house that is to the north and out of any danger. 12:00 p.m.: After leaving a message for the minister (who, after all, is in the middle of second service) about the whereabouts of his kids, we're finally off. Interstate 5 is choked with traffic in both directions. With Interstates 15 and 805 shutdown, it is the only north-south highway open in the county. When we finally arrive at the house, I call Kristi. They are in the same traffic, headed back to church. They stay on the freeway, bypassing church, and continue to crawl towards us. They eventually arrive. A lunch is prepared (ironically, barbeque). It's not to long before we feel the need to get home, so we load up and drive towards the smoke to the southeast. The minister's family would end up staying at this house several days. 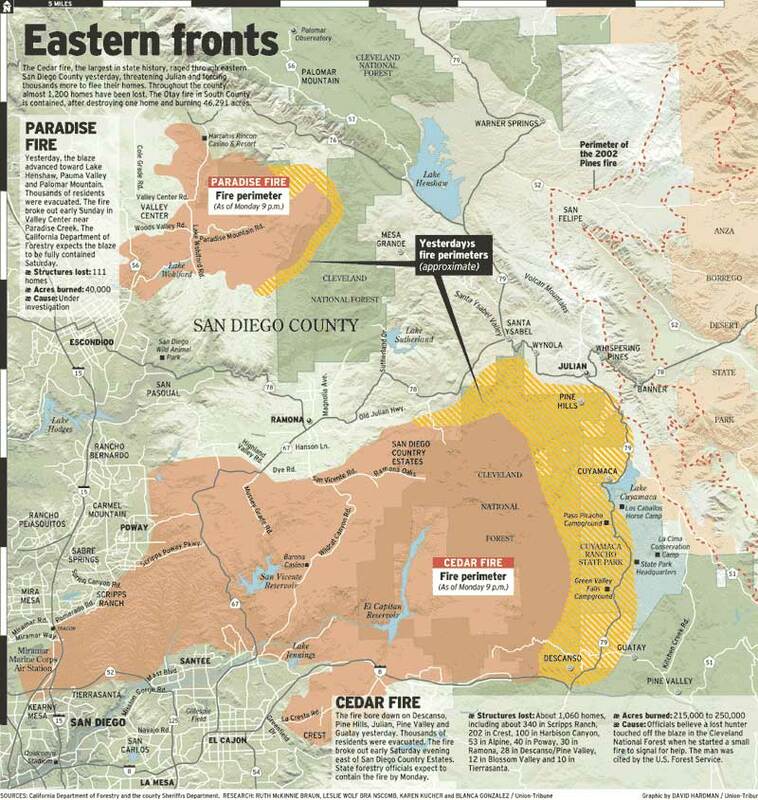 The Camp Pendleton fire (otherwise never mentioned) is dead center of the map. To its Southeast is the Paradise Fire, and then the Cedar fire. 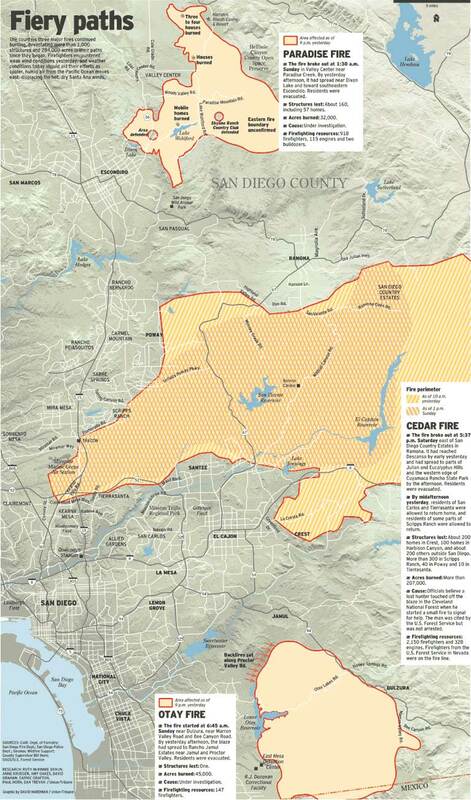 The Otay fire's cloud joins Cedar's; it is not distinct. 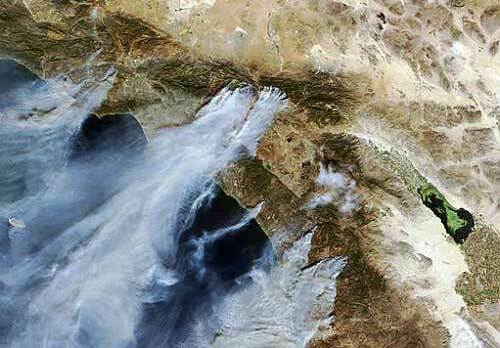 Finally, there is still another fire just in the frame that is actually in Mexico. 2:00 p.m.: There was to be a Y Guides hike up Black Mountain this afternoon. Yesterday Kristi was strongly urging Doug and me not to go because of the heat. Today it was cancelled, due to air quality. As winds were still keeping smoke away from Penasquitos (and therefore, hopefully, fire) the skies are still clear here, and the view from Black Mountain of the county on fire would have been incredible. But Black Mountain is covered with the same dry, native chapparal that is burning all over the county. On top of a tinder box is no place to be with sparks blowing all around. So common sense prevails, and we stay put in front of the TV, where the news begins to worry us. The fire is to the West and South of us. Today the Santa Ana winds are blowing from the Northeast as opposed to the usual due East. As long as the wind direction doesn't change, Rancho Penasquitos should be okay. Even if winds did shift, the fire is nearly 10 miles away, with two communities and a whole lot of houses between us and it. But looming over us is Black Mountain. Usually it represents open space, a place to hike and mountain bike. This afternoon, however, it was a threat. The fire was far away and the winds blowing away from us, but watching neighborhoods burn on TV, we couldn't help thinking about what might happen if the fire "spotted" to Black Mountain. San Diego's mayor asks that all businesses shut down tomorrow and that everyone stay home. 3:30 p.m.: At some point in watching all the destruction around us on TV, Kristi and I looked at one another and decided we could be using this time a little more productively . Kristi had just been in the fire zone that morning, and we had all visited Los Alamos a month after the 2000 Cerro Grande fire. We started by making a list of things we would remove from the house, starting with boys and dog. Keith backed up the computer hard drive. Kristi packed a couple of suitcases full of clothes, and Keith packed a box of photo albums and video tapes. 4:30 p.m: In the fading light, Keith walked through the house video taping, recording the contents of each room in case of total loss. Now that's a cheery job. 7:30 p.m.: As we knew from watching the Los Alamos fire of 2000 on CNN, picture of fires at night are even more lurid and spectacular. But also more disorientating. 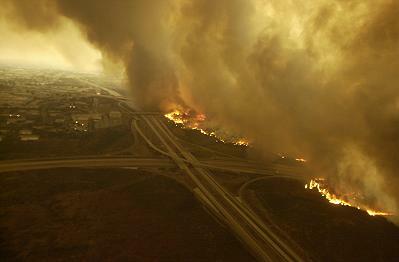 The last and most disconcerting image we saw that night before turning in was the fire moving westward down a hill into Poway, the community due east of us. Keith wakes up a couple times in the night to check the night sky for smoke. Stars are still visible, indicating winds haven't shifted and we are still safe. In the morning a check of the news confirms that urban San Diego is pretty much safe. We move our packed bags back upstairs, but don't actually unpack them yet. That morning Keith, remembering the lure of climbing Black Mountain the day before, makes do by driving to the highest point in Penasquitos to take a panographic picture. Already the smoke isn't as think over the south, and appears more dissipated. Keith (board vice chair) confers with the board chair and they cancel Tuesday's Church Board Meeting. Sunday and Monday's fire paths. Canceled: Work, School, Church Executive Board Lunch, Basketball Practice. Moved: Monday Night Football, from San Diego to Phoenix. 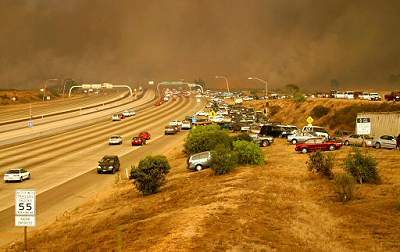 Qualcomm Stadium's parking lot became a de facto emergency evacuation center for Tierrasanta and Scripps Ranch. The Red Cross set up a shelter in Balboa park, but everyone stopped halfway there in Mission Valley. Keith returns to work. Freeways reopen, but traffic extremely light. Although Penasquitos remains in sun light, Intuit, like Torrey Pines Christian Church, is under the pall of smoke. Many people are driving and going about their business with face masks on. The Intuit building quickly smells of fire and smoke and ash and people enter and exit and exchange indoor air for outdoor air. 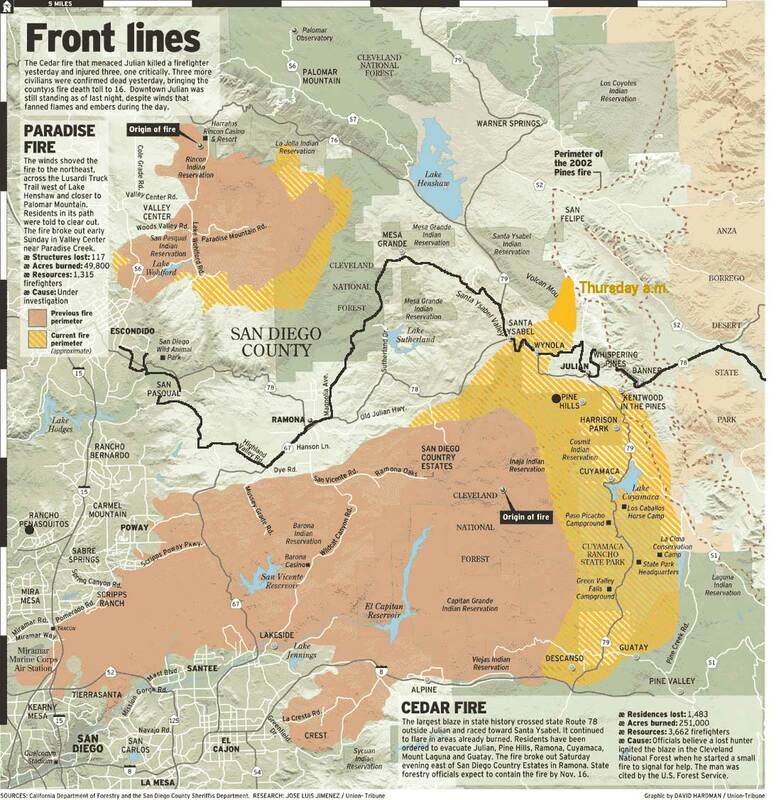 The Cedar fire has now claimed Cuyamaca State Park. Canceled: Schools closed again. Church Board Meeting canceled. San Diego completely blanketed by smoke. Red shows areas that burned. Line is California/Mexico border. Winds have died down, which we know is good for fire fighting. But with nothing blowing the smoke away, this is the worst day for smoke. As fire smoke merges from all fires, the entire county is blanketed, including Penasquitos: our sky to this point had remained relatively clear. The daylight is an apocolyptic brown-orange. Click to enlarge and see special editions I've made to this map. Local TV Stations with major network affiliations switch from constant live coverage back to soaps, with occasional break ins about the stirring defense of Julian (which killed one firefighter and injured two others today). Canceled: Wednesday night program at church. Basketball practice. Schools announce closure for rest of week. A return to normalcy: clear skies and clogged freeways. The skies clear up significantly as the wind shifts back to coming off the ocean. It is now fresher outside than indoors (houses, cars, work) where are is not circulating as well. Newspaper reports state that although a Camp Fire Girls camp at Cuyamaca and the Cuyamaca State Park Headquarters burnt to the ground, Camp Marston , Paso Picacho , and Green Valley miraculously survived. Of course, "survived" means their man-made structures weren't destroyed; it remains to be seen how much of their natural beauty remains. Stonewall Peak , Cuyamaca State Park, from south of Paso Picacho. Not quite news (but something more than rumors) circulates about teachers and coworkers and church members who lost their houses. Early morning fog. Nip in the air. Moisture and significantly cooler temparatures. This is the first day I dare to put the top back down on the convertible. Closed spaces (e.g. cars and buildings) are now noticeably smokey compared to the wind-cleasned outdoors. Probably due to the carpets in both cases, and the ash people brought in on their shoes. Halloween is held. Traffic is significantly lighter than in years past. We saw most of the kids from our street, but few others. People didn't venture far from home this year. Brad's basketball games at Alliant International University (AIU) were a go, so Saturday morning we headed into Scripps Ranch. It had rained just a little the night before, and it seemed to kick up the smell rather knock it down. Whether it was the rain or just psychology, but visibility seemed to go on forever. The drive into Scripps Ranch and the University was amazing. 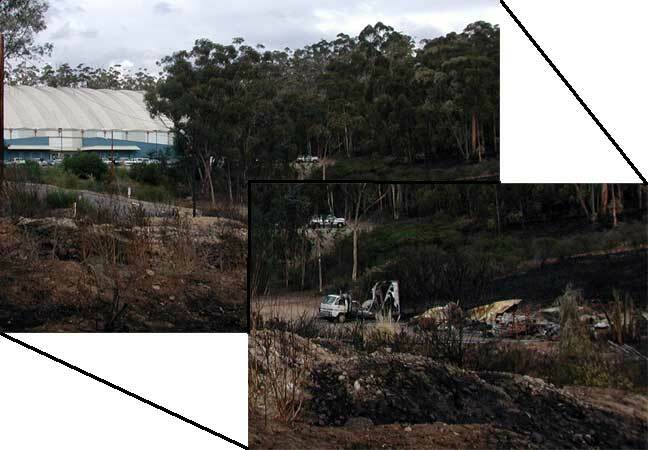 The ground was black, as all humus had burned off, but some bushes and most trees (Eucalyptus) remained. The fast moving fire had consumed the highly combustible and moved on before all the trees could go. Just as Nature had intended, I suppose. Still, some stumps were unmistakably still smoking, even after the rain. At least two forestry teams were working on campus, cutting down trees. The fire came right up to the basket ball Quonset. That entire ridge is blackened. That was some structure on the hillside. As you can easily tell by the hard edge of the silhouette of the ridge line, all underbrush has burned away, leaving only the higher branches of the Eucalyptus. trees. Although we saw no major structural damage, we saw many destroyed out buildings and dumpsters. Within 100 yards of the basketball Quonset was a destroyed maintenance yard, complete with melted shed and destroyed trucks.